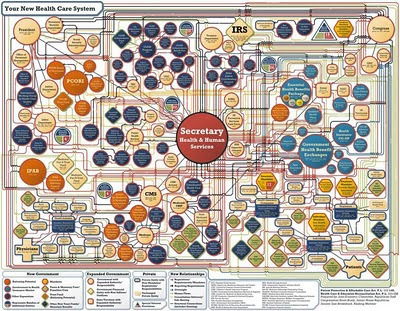 The Dividist Papers: CRS: "The precise number of new entities that will ultimately be created pursuant to PPACA [Obamacare] is currently unknowable"
CRS: "The precise number of new entities that will ultimately be created pursuant to PPACA [Obamacare] is currently unknowable"
This updated chart of "Your New Health Care System" got a lot of play around the right-o-sphere. The chart is, of course, a partisan Republican attack on the Obamacare hairball that was steamrolled on a partisan Democratic vote over a loud but legislatively impotent Republican minority. 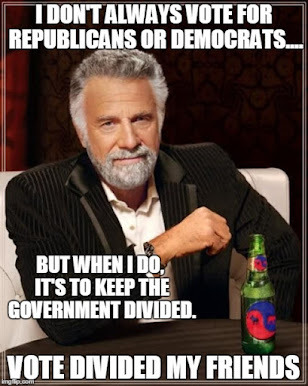 However - to paraphrase a favorite quote ("Just because you are paranoid, doesn't mean they are not out to get you") - just because it is partisan, does not mean it is not true. 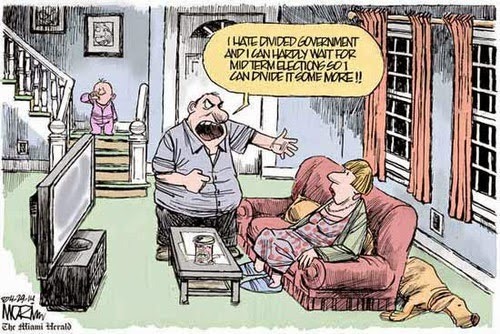 This one has the ring of truth and garnered accidental support from the non-partisan Congressional Research Service. The precise number of new entities that will ultimately be created pursuant to PPACA is currently unknowable.. The legislation sometimes indicates when and where certain entities are to be established, how members are to be appointed, the amount and timing of appropriations, whether certain general management laws are applicable, and when the entities will cease to exist. In other cases, however, PPACA is silent with regard to these and other issues. The degree of specificity in these provisions may have implications for congressional control and, conversely, the amount of discretion that agencies will have in the implementation of the legislation. PPACA significantly increased the appointment responsibilities of the Comptroller General of the United States, and it is unclear how the Government Accountability Office (GAO) will be able to independently audit entities whose members are appointed by the head of GAO." The report was released in early July, but the MSM and blogosphere are just now beginning to pick up on the ramifications of what it says about our new Health Care law of the land. "Don’t bother trying to count up the number of agencies, boards and commissions created under the new health care law. Estimating the number is “impossible,” a recent Congressional Research Service report says, and a true count “unknowable.” The reasons for the uncertainty are many, according to CRS’s Curtis W. Copeland, the author of the report “New Entities Created Pursuant to the Patient Protection and Affordable Care Act.” The provisions of the law that create the new entities vary dramatically in specificity. The law says a lot about some of them and a little about many, and merely mentions a few. Some have been authorized without any instructions on who is to appoint whom, when that might happen and who will pay." "A sprawling bureaucratic giant - nobody knows how big it will be. That seems to be the result of President Obama's new health care law. According to Politico, a recent report says it's "impossible" to estimate the number of agencies, boards and commissions created by the new law. The Congressional Research Service report points to many reasons for this. First off, the parts of the law that create new bodies vary drastically. In some cases – the law gives lots of details... in other cases, barely a mention. Also, the law authorizes some new entities... without saying who will do the appointing, or when it will happen. And all this means some agencies could wait indefinitely for staff and funding... while others could multiply... creating quote "an indeterminate number of new organizations." So far this is shaping up to be exactly what the critics were afraid it would be... How will the government manage our health care if it's "impossible" to know the number of agencies, boards and commissions created by the new health care law?" "CRS wanted to say that there wasn’t enough certainty in the number of agencies, panels, and committees to put them into flowcharts with connecting lines. Like Nancy Pelosi once argued, the CRS report says that we can’t know what’s in ObamaCare until the government rolls it out . That in itself is a big, big problem. It seems clear that Congress just authorized a self-perpetuating bureaucracy, one that can expand on its own and make determinations far outside of the boundaries Democrats promised during the ObamaCare debate. And if that’s true, then it is equally true that the claims made on the cost of administering ObamaCare had no real basis in fact. How can one estimate a cost for a bureaucracy that is entirely undefined in size and scope?" "Just in case anybody missed Copeland's point, Barbash noted that "implicit in the report is a message not to take too seriously the elaborate charts and seemingly precise numbers peddled by Republican critics that are designed to show the law's many bureaucratic tentacles." But folks who actually read the Copeland report and scan those two scary GOP charts are quite likely to reach the contrary conclusion. In fact, one might even think the GOP critics were being too easy on Obamacare... Copeland looked at only part of the picture. The rest of the picture -- those demonstration projects, grants, trust funds, programs, systems, formulas, guidelines, risk pools, etc. -- will result in at least as much, if not much more, bureaucratic expansion. So, while the precise number of new government bureaus and bureaucrats created by Obamacare can't be known now, what is known beyond any shadow of a doubt is that there will be more, much more, government." Some Democrats have taken comfort in a recent tracking poll indicating that opposition to Obamacare has marginally decreased. I’d put that in the same category of self-delusion as “America is a center-left country”,”demographic realignment means a permanent Democratic majority", and “a Republican cannot win Ted Kennedy’s seat”. This is legislation that only looks good if you blur your vision and avert your eyes. The closer you look, the uglier it gets. Make no mistake - the GOP will make sure everyone gets a good long rub-your-nose-in-it look between now and November. Every GOP candidate will be taking shots at Obamacare, and that is one slow fat rabbit to hunt. When you look at the chart and read the CRS report - the campaign ads write themselves. Since no Democratic Party candidate has any real idea of what is in the hairball they voted for – well – lets see what happens when GOP ads start putting it on the air 7×24 and they have to keep explaining the details to the voters. The administration is not taking this lying down - in another triumph for "framing" over content, they've recruited Andy Griffith to lead the charge with a misleading, taxpayer funded, possibly illegal, pre-emptive advertising strike. After all, if you can't trust the Sheriff of Maybury - who can you trust? Results just in on a somewhat more reliable Obamacare sentiment poll taken on Tuesday - As goes Missouri - so goes the nation?